The current dictator lacks his father's finesse — and had been paying for it. But Bashar al-Assad's recent horrific chemical-weapon attack in Khan Sheikhoun appears to have prompted a change in U.S. policy. At a news conference in Moscow, Secretary of State Rex Tillerson declared, "The final outcome in our view does not provide for a role for Assad or for the Assad family in the future governance with Syria." Tillerson's comments were noteworthy because, despite six years of Bashar's televised barbarism, there remains a strong American impulse to keep the Syrian dictator in power. The reason most commonly cited is the U.S. failure to produce stability in Iraq after toppling Saddam Hussein in 2003. The rationale is further bolstered by assumptions left over from the 1990s, relics of a bygone era that hold little practical value today. America's initial failure to secure the peace in Iraq need not become a stovetop to avoid because of a burn suffered during adolescence. Important lessons can be learned and applied in the future, and the urge to overcorrect mistakes from past presidencies can be minimized. In the case of Syria, a more informed strategy can be successful only if mistaken beliefs surrounding the House of Assad are finally laid to rest. The truth is that Bashar Assad is not his father, and he's not a reformer. Nor is he a strongman leader who can be relied upon either today or in the future. Understanding why is crucial as the Trump administration clarifies its position on Syria. "You can't make war in the Middle East without Egypt, and you can't make peace without Syria" was the adage coined by Secretary of State Henry Kissinger long ago. That observation came as a result of his famous Middle East "shuttle diplomacy" in the aftermath of the 1973 October war and was in reference to Bashar's father, Hafez al-Assad, who ruled Syria from 1970 until his death in 2000. Aside from bringing much-needed stability to his country, the elder Assad sought to dominate his neighbors, as did most of the young, independent Arab states. The high card Hafez held was that of the region's spoiler, but he managed to play his hand well. As such, he defined for Syria a role that impressed upon the region that all roads to progress led to Damascus. During and after the first Gulf crisis in 1990–91, America's Arab allies frequently called on President George H. W. Bush to meet with Assad. Secretary of State James Baker III came to conclude in his memoir, The Politics of Diplomacy, that "Syria was the key to significant progress. Assad's engagement would signal, in the most dramatic fashion, that our efforts were legitimate in Arab eyes." With Hafez al-Assad at the helm, Syria may have been Iran's junior partner, but it pursued its own distinct interests. For example, his foreign policy was independent enough to engage in a peace process with Israel under American auspices despite Iran's adamant opposition. After 1973, the risk-averse Hafez also managed to steer clear of direct military conflict with Israel from the Syrian side of the Golan Heights, instead using Hezbollah in Lebanon to apply kinetic pressure. During the 1990s, one could debate whether Iran or Syria exercised more control over Hezbollah's actions, but one thing was clear: When the fighting needed to stop, Damascus was the destination, not South Lebanon, Beirut, or Tehran. To that end, Secretary of State Warren Christopher negotiated two cease-fires between Hezbollah and Israel with Assad in 1993 and 1996, providing rules of engagement to prevent skirmishes from becoming full-blown wars. Hafez al-Assad was the guarantor. The proverbial apple, however, fell far from the tree. Since Bashar inherited the reins of the Syrian state in 2000, he's bounced from one colossal blunder to another. Nowhere was that more evident than in the realm of foreign policy, where in a few short years he undid most of his father's achievements, isolating and weakening the state. He demonstrated his naïveté in power politics by altering his relationship with Hezbollah from one of strength to one of weakness. For instance, the elder Assad never met with the terrorist group's leader, Hassan Nasrallah, viewing him as just one of several levers of power at his disposal. While Hezbollah was used to further Syria's interests, he was not worth Hafez's hospitality. Bashar, for his part, formed a close and personal relationship Nasrallah and was reported to be in awe of him. Bashar also transformed Syria's relationship with Iran from junior partner to client state. A result was that Hezbollah received all the regional accolades for surviving its 2006 war with Israel while Syria's relations soured with the Arab world. Those decisions stood in stark contrast to those of his father, who a decade earlier joined the coalition against Saddam Hussein in exchange for U.S. acknowledgment of Syrian interests. Hafez understood that the world had changed with the fall of the Berlin Wall in 1989. He saw the elder Bush's "new world order" beginning to take shape, and as Syria specialist Raymond Hinnebusch explained, he preferred to influence it rather than become its victim. Bashar missed that boat entirely. While President George W. Bush described an "Axis of Evil" that included Iran, Iraq, and North Korea, Bashar actively worked to promote his relations with that axis rather than rethink his position. He began pursuing a domestic nuclear-weapons program with North Korea's assistance in 2001. Its existence was made public only when Israel destroyed the facility in a 2007 airstrike. The greatest foreign-policy fiasco of Bashar Assad's making was the 2005 crisis in Lebanon. Syria came to dominate its smaller neighbor after the Lebanese civil war began in 1975. Having seized the moment in 1991, Hafez Assad joined with the coalition to oust Hussein from Kuwait, and the U.S. recognized Lebanon as a part of Syria's interests. His hold over his weaker neighbor was one of Hafez's most important accomplishments, and something Bashar was certainly aware of when he took over the Lebanon portfolio in 1998. He managed to undo three decades in the blink of an eye when the international community joined together to kick Syria out of Lebanon in early 2005. Instead of a straw that broke the camel's back, Bashar's last offense was more like a cinderblock. His security services teamed up with Hezbollah to assassinate Lebanon's former prime minister, Rafik Hariri — not with a gunman's bullet or poison from Vladimir Putin's private reserve, but by way of a 2,200-pound truck bomb that killed its target and 21 others and wounded 220 in the Corniche Beirut seaside promenade in broad daylight. It left a 30-foot wide crater, knocked down buildings, lit cars on fire, and blew out all the windows of the InterContinental Phoenicia Hotel, which had until then served as a sign of Lebanon's revival after decades of civil war. Not only did the assassination prove to be a political and economic disaster for Syria, it even managed to unite America and France over Syria at a time when relations were so frayed that Congress was still eating "freedom fries" rather than "French fries." Most striking is that from a position of isolation and weakness in 2007, Assad's and his country's temporary rehabilitation were born not out of any action he took or decision he made to change course, but by Western politicians and media who wore rose-colored lenses that blocked out reality. Politicians at the highest levels of the U.S. government believed in a mirage they had created for themselves. For example, Representative Nancy Pelosi stood on Syrian soil in April 2007 and declared, "the road to Damascus is a road to peace." One can almost picture Hafez al-Assad flashing her a thumbs-up from beyond the grave. Secretary of State Hillary Clinton bought the mirage as well, telling CBS News three weeks into the 2011 protests, "There is a different leader in Syria now. Many of the members of Congress of both parties who have gone to Syria in recent months have said they believe he's a reformer." Bashar Assad and his wife, Asma, pose for their laudatory profile in Vogue magazine, which was released a few weeks before the Syria protests began in 2011. The tone-deaf article, full of praise for Syria's first family was subsequently scrubbed from their website and is only available at an Assad fansite, PresidentAssad.net. No one inside the Beltway, however, was duped more than Senator John Kerry, who during President Obama's first term was the chairman of the Senate Foreign Relations Committee and Obama's informal envoy to Syria, and later secretary of state. In 2008, a few months after Syria's nuclear program became apparent, he penned an article for the Wall Street Journal with then-senator Chuck Hagel, who later became secretary of defense, called "It's Time to Talk to Syria." Kerry stood at the vanguard of mainstream politicians seeking to rehabilitate Assad, whom Kerry considered to be "my dear friend." In April 2010 he said, "Syria is an essential player in bringing peace and stability to the region." 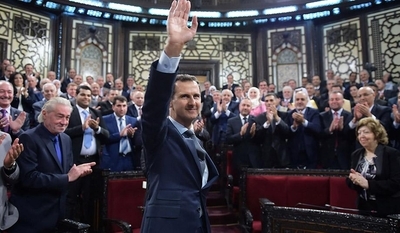 Even when the protests began, he delivered a speech in Washington heaping praise on Assad for the generosity he personally extended during his many visits to Damascus. And he wasn't alone. From 2007 through 2009 a cadre of senior American statesmen donned the rose-colored lenses while seeking to engage the Syrian leader. Bashar al-Assad may be brutal, but he is not cunning, disciplined, or trustworthy like his father, who is remembered by many as resembling Mario Puzo's Godfather character. Hafez wanted his son Basil to succeed him, but Basil was killed in a car accident in January 1994. In other words, Hafez wanted Michael Corleone but was stuck with Fredo. Bashar isn't a closet reformer either; he never planted the social and economic seeds to make Syria bloom, despite his early opportunity during the "Damascus Spring." Nor does the case of Bashar resemble that of Egypt's Hosni Mubarak. The Egyptian leader was imperfect and far from a reformer, but he was an American ally and the guarantor of a peace with Israel that prevented war among states, as Kissinger once observed. Bashar is the Middle East arsonist seeking rewards for putting out the fires he starts. Furthermore, his judgment is so poor that his recent decision to use chemical weapons may ultimately spell the end of his regime -- a classic case of snatching defeat from the jaws of victory. He remains a dangerous tool of Russia and Iran, serving as a magnet to jihadists from across the world. As a serial bungler, even left to his own devices under the best of circumstances, he has constantly chosen to act against American interests. Lacking enough military strength to hold the country together, he is now conscripting old men and underage women to serve in his military. Despite Russia's and Iran's considerable military assistance, he apparently still needs to resort to internationally banned chemical weapons to take back Syria. Whatever land is left beneath his feet will become a forward operating base for Russia and Iran — a threat posed from NATO's south and Israel's north. For too long, engagement enthusiasts have chased the Assad mirage based on beliefs that are unmoored from reality. Much like the antiquated policies that spring from those assumptions, the Assad dynasty has lived long past its shelf life. History's trash bin eagerly awaits.